Customer Buzz, Tips & Info for Online Business, and The Digital Lifestyle. We are honored and excited to be working with The David Scott Company on the next iteration in their online presence. The David Scott Company (DSC) has been doing business for a long time – since 1972. As a distributor and manufacturer of medical equipment and supplies, they knew early on that ecommerce would play an integral role in the future of their company, not only for sales, but also for visibility. We are happy to call the DSC a customer of ours now, and we are well underway on building the next version of their website. 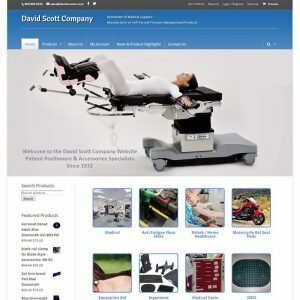 Many of the issues being addressed in this new site have to do with usability and mobile compatibility, but we are also adding features and levels of refinement that will live up to David Scott Company’s sterling reputation and quality products. As always, our work will include updated SEO practices and better social media integration. The existing platform of DSC operates on WordPress and WooCommerce (a winning combination), we are performing an upgrade on their existing platform, keeping the best of what they have and improving on everything else.